Protesters filled the rotunda of Wisconsin's capitol building in Madison this week to register their opposition to Gov. Scott Walker's plan to strip public employees of union bargaining rights.Flickr/<a href="http://www.flickr.com/photos/48432646@N07/5452233138/">Geekahertz</a>. [The bill] would require most public workers to pay half their pension costs — typically 5.8% of pay for state workers — and at least 12% of their health care costs. It applies to most state and local employees but does not apply to police, firefighters and state troopers, who would continue to bargain for their benefits. Except for police, firefighters and troopers, raises would be limited to inflation unless a bigger increase was approved in a referendum. The non-law enforcement unions would lose their rights to bargain over anything but wages, would have to hold annual elections to keep their organizations intact and would lose the ability to have union dues deducted from state paychecks. Now why would this be? Is it because collective bargaining is somehow less of a problem for public safety employees than for teachers? Because strikes by cops are less hazardous than strikes by teachers? Because public safety employees tend not to be hard bargainers anyway? Because public safety employees are poorly paid? Or is it because teachers tend to vote pretty reliably for Democrats and public safety employees don’t? Bingo. The irony here is that when you hear those cherry-picked horror stories of vastly overpaid civil servants (usually the result of overtime abuse of some kind), nine times out of ten it involves a public safety employee. It’s not teachers who get to retire at age 50 and it’s not teachers who end up padding their hours in their last year of work and retiring on 120% of their usual income. Most of the time, it’s police, firefighters, and state troopers. 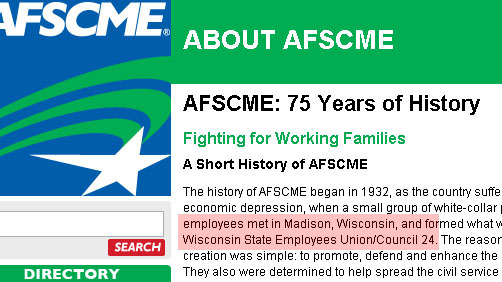 But they’re the ones exempt from the Wisconsin GOP’s union bashing drive. Go figure.